Away from Body and/or Mind Now if in the last several months you have been away from Nigeria, temporarily vacated your sense of surroundings, or both, would it not be pardonable to wonder what the hullabaloo in the press and the country has been about? Much ado about Salami, you may think. Now why would such an altruistic move by the CJN be rebuffed by the PCA, after all it could be said that the Supreme Court is the pinnacle of aspiration and career for any professional in the Nigerian judiciary. The CJN is not obliged to offer such prized elevations to any judge. In recognising Salami’s contribution to the judiciary, the CJN had demonstrated leadership and patriotism, and an unfailing commitment to the Nigeria project; even in the last hours of his tenure. But was this a Greek gift, did the silk robe conceal an unsheathed sword? From the grapevine we discover that Salami was by-passed for promotion to the Supreme Court because of federal character. After taking advice from senior judges that he respected, Salami apparently made the decision to work the path towards PCA rather than queue up behind his juniors in the Supreme Court. The offer of a seat in the Supreme Court, from his perspective, would therefore amount to a demotion rather than a promotion. The CJN should have known, and empathised with this fact. Secondly, in the Court of Appeal, Salami had the liberty to shape and nurture a select core of next generation lawyers within his fiefdom in the disciplines that made names for the likes of Kayode Eso, Chukwudifu Oputa, Andrews Obaseki and others – simplicity, honesty, diligence, courage and personal conviction. But then that is just one side of the coin, others would say that Salami was more Fagin to their artful dodger, and that he was actually grooming his proteges in the finer arts of duplicity and sophistry. One should not be surprised that the PCA resisted the elevation; leaving corruption aside, there is greater prestige in being the PCA than in assuming facelessness in the Supreme Court. More so, as the image of the judiciary in Nigeria today is at an all time low. Supreme Court judges are held in the same low esteem as most of the rest of the judiciary. In fact, when recently (in the media), Nigerians have talked of the judiciary being the last bastion of the nation, they often referred to the actions of the Appeal Court, and not the Supreme Court. Since the 12 2/3 case, it would appear, to most Nigerians, that the Supreme Court, in composition and general standing, has been on a downward spiral. So, whether for prestige, or to avoid the stigma of the Supreme Court, the CJN’s offer would be a poison chalice to the PCA. But then again, it is just possible that, unknown to Nigerians, the PCA had cornered the market on large settlements for favourable judgement in the Appeal Court, and the CJN, having the best interests of Nigeria at heart decided to break up the party for Salami and his merry men. Yea or Nay, I guess one would need to examine the antecedents of Salami, his lifestyle, colleague/peer opinions and his present economic circumstance in order to gain an inkling on what the truth is. You would have expected that these august bodies would come together and form one panel, or at least consult each other and then save face with a press release explaining the need for two “linked” panels. But perhaps the composition and aspirations of these groups are so different that their horses cannot be watered from the same trough. The NBA and NJC, in theory, should include some of the best minds and the most esteemed lawyers should be counted in their gatherings, one therefore wonders why such intelligent, distinguished and mature persons, could not even agree to cooperate in an investigation that impinges on all! The question that comes to mind is this: is not the same law that they practise? 4). The panels disagree on cause and fault! But what were these panels constituted for? What was their remit? Was it to adjudicate/rule or provide opinion on the matter? What was the mandate given to each, and was there any overlap, or perhaps the matter involved such legal technicalities that only the cognoscenti could begin to comprehend it. To the common man, there appeared to be no disagreement in the scope that would justify the contradiction in the panels’ pronouncement. So, what could be so complex and subjective about the events that transpired, and the interpretation of same in the light of the laws of Nigeria. Given the experience of those appointed to the panels, could the details be so complex and subjective that they not only disagree, but that the outcomes from both panels are irreconciliable. Further, the root cause analysis differs, and the interpretation of conduct disagrees; but the laws from which these conclusions were synthesised are the same! In what would turn out to be a half-hearted attempt to deal with a major issue that threatens the nation, the NBA arrives at a verdict that identifies a culprit, and immediately lets him off with a reprimand and a disagreeable letter. The NBA indicted the CJN for misconduct and overreaching the limits of his office, they also identified two collaborators. But they should have gone further and recommended sanctions against the CJN for abuse of office, and taken action against the two lawyers accused alongside the CJN for aiding and abetting him. If this man was guilty, he had brought the judiciary into disrepute and the sword should not have been sheathed; his ox should have been gored, mauled, or whatever befit the occasion. Also, his accomplices should have been sanctioned, so far as the constitution allows the NBA to, and the NBA should have supported this with the sternest language – it was an opportunity lost! But then, maybe those who live in glass houses have learnt not to throw stones. On reflection and retrospection, the NBA may have recognised that far worse offences had gone by without so much as a blink of the eye. Better not to make a scene, and attract the community to one’s moral nakedness. The NJC responded with a judgement of its own. Now, one would have expected a CJN who is indicted by everyday lawyers to have stepped down voluntarily, especially as his term was almost up, and to retain some shreds of dignity, in what appears, on the surface to be some indiscretion on his part. Nevertheless, pride/dignity seemed a distant concern in the battle at hand, and so the NJC responded with its own broadside, indicting the PCA for perjury. The stakes were suddenly much higher! The NJC also recommended that the PCA be suspended and dismissed from the judiciary for not apologising to the CJN when told to do so. But they should have gone further. If the PCA perjured himself, it is a criminal offence and must not be swept under the carpet. He should be charged to court and the full weight of the law brought to bear on him with due punishment to serve as deterrent to others. All the other judges that sat on the compromised tribunals should likewise be dismissed and the lawyers that colluded with said judges should be disbarred. In the fight for a New Nigeria, these crimes tear at the very foundations of our society and they must not be allowed to lie, rather they must, as a matter of priority be rooted out. So it was a shock and a sick joke for the NJC to have asked the PCA to apologise and so to end the matter. Fortunately for Nigeria, he did not, and now, maybe we will have an opportunity to hear the truth in a competent court. Yet how could the courts act? The NJC sat and deliberated in contempt of court, so it would be something of an abormality to return to the court to put the seal on a fait accompli! Then again, pigs have been known to fly in Nigeria. In a press release issued by the Office of the president, the executive acceded to the request of the NJC, and that, within a few days of said request being received! Given the sensitivity of the matter at hand, the precariousness of the security situation in the country, and the pressing problems of political and social disconnect caused by the last elections, one would have expected the presidency to give very deep thought to the matters at hand. The national interest must be of the highest priority in making a decision, even if not for posterity, then for the present peace and stability for the many millions that inhabit the country today. It was vital that the president be seen to be impartial, in the face of personal interest; after all, the man at the centre of the controversy had been involved in a number of judgements given against the president’s party. Justice they say, must not only be done, it must be seen to be done. President Jonathan should have taken time out to think and consider such a weighty issue, perhaps even to pray. It appears he didn’t. To avoid a perception of conflict of personal interest and for the sakes of national security, the president should have commissioned his most trusted aides to research the issue, and for the sake of Nigeria today and tomorrow, find out the facts. Mr president should also have consulted broadly, involving the legislature, whose support he would need, if the PCA were to be dismissed; and he should have sounded out some of respected elders in the legal community. Finally, having decided on a course of action, the president should have ensured that from A to Z, the constitution was observed, to the letter. In essence act decisively but holistically, not for a palliative but rather towards a panacea. Mr president did not prevaricate, but was the decision holistic and was it a good first step towards a lasting solution? The Nobel laureate, Wole Soyinka, in his 1972 book “The Man Died…” issued a famous quotable, to wit, “The man dies in all who keep silent in the face of tyranny.” For all the alleged timidity of Nigerians, our fear is not so deep that people refrain from complaining, when the government of the day is perceived to be acting against the national interest as seen by the masses. In some cases, the complaining may be reduced to murmuring, as sometimes happens under military regimes when speaking has become hazardous to health. We thank God that is not the case today in Nigeria. And so the people spoke, and very few were in support of the president’s decision. Notable lawyers, the NBA, the Nigeria Labour Council (NLC), the main opposition parties, people from all walks of life, both home and abroad; all spoke against what was generally perceived as a travesty. The Office of the president was undeterred. Meanwhile, the NJC, yet fulminating, continued to breathe threats against the PCA. 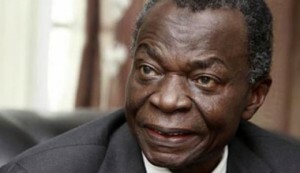 This “inbred” body, with the majority appointed by the CJN, a party to the dispute, was not bothered that its initial action and ongoing pronouncements were in contempt of an existing case before a competent court. The third arm of government had arrived at the zero game, and they did not even know it. Following the disastrous outing of the UK and the USA in Iraq, Tony Blair opined that history would be the judge of what they did in that country; whether good or bad. The president may like to take the same line; perhaps history will indeed say differently, but Mr president must hope that history is not a few months away as in the case of Mr Blair, and that the folly of his actions does not become apparent in the very immediate future. Philosophers are grounded in a truth that the executive would benefit from learning: that it is hard to know better than the man, what is good for the man, and it is not often the case that leaders know better than the people on matters that impinge on their daily lives in fundamental ways. But then what is our duty as the people, citizens of Nigeria; at a time like this? We cannot afford to keep quiet, while the axe is swung relentlessly at the foundation of our home, our silence will not stop the attacks on the pillars that hold us up. We therefore need to complain loudly and publicly, we should not let this be swept under the carpet nor forgotten out of hand; we must press the case, and see that proper justice is done either way. To keep quiet now would be to regret at leisure and with pain. Remember; if you are not part of the solution, then you must be part of the problem.